Welcome to 20 Years On, a series here on VivaLaVidaFM where we take one of the games hottest prospects and see where they end up at the end of their career in Football Manager. In this post, we look at two FM18 wonderkids, Ryan Sessegnon and Matt O’Riley, to see where they end up 20 Years On.Let’s start with Ryan Sessegnon and then follow with Matt O’Riley. Ryan Sessegnon is an English youngster plying his trade for Fulham in the English Championship. He made his first-team debut aged 16 years and 81 days in the EFL Cup before going on to debut in the Championship and FA Cup. Scoring on his debut in the FA Cup made him one of the youngest scorers in the competition’s history. 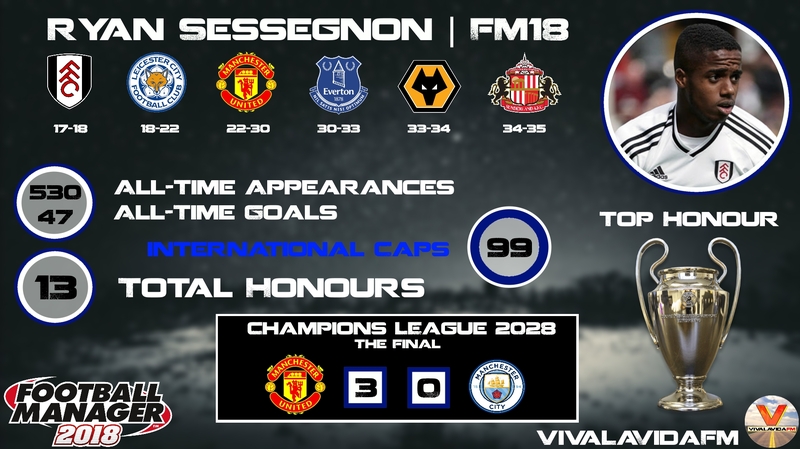 Internationally, Sessegnon has represented England in several age groups and was a key member of the under 19 side that won the Euro Under 19 finals in 2017, finishing as joint top scorer and earning his place in the team of the tournament. Sessegnon only spent one season with Fulham in-game as he made 48 appearances, scoring 8 goals. He left Fulham for the Premier League after they failed to earn promotion. Leicester City paid £17.25M to get Sessegnon. The club signed him in 2018 and he went on to play 177 times for the club. The closest the club came to success was in the 2021 FA Cup where they lost in the final 3-2 to Manchester City. Sessegnon left Leicester in 2022 to join one of the World’s biggest clubs. Sessegnon joined Man Utd in 2022 for a large fee of £64M. He made more than 200 appearances in his time there but never really became a key player that you’d expect a 64 million pound man become. He did win 13 trophies whilst with United and left in 2030 to find more first-team football. Everton signed Sessegnon for £28.5M in 2030, a fairly large fee for a player aged 30. He was a rotational option for Everton in his time there and once again he had to leave to find first-team football. A disappointing spell with Wolves followed as he made just 7 appearances in his one season at the club. Sessegnon left on a free at the end of his first season. Sunderland became Sessegnon’s final football club. The Championship side signed him on a free from Wolves and he played in 18 games before retiring at the end of the season in 2035. Ryan Sessegnon came so close to earning 100 caps for the English national side, finishing his career stuck on 99. With his time with England, he failed to help them progress further than a semi-final in either the World Cup or European Championships. 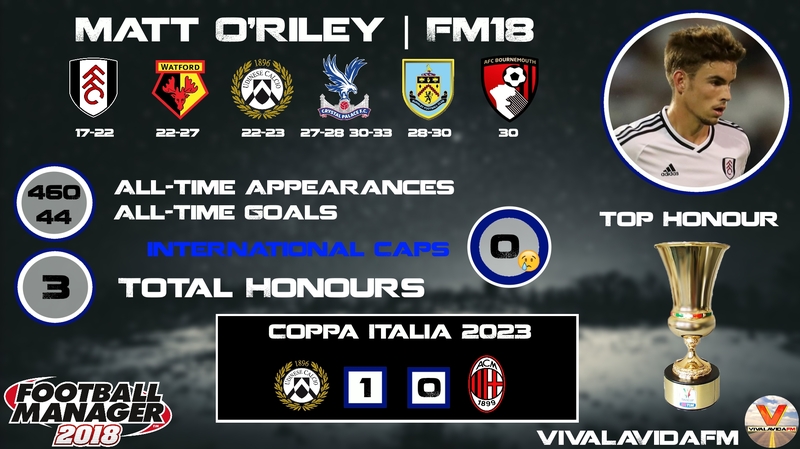 Matt O’Riley is another prospect in the Fulham academy with decent potential on FM18. He has already made his debut for Fulham, playing against Wycombe in the Carabao Cup. The young midfielder could develop into a good Premier League player in-game and will be hoping to follow Ryan Sessegnon to one of the top English sides. Matt O’Riley quickly became a first-team regular at Fulham and played 140 games for the London club. Unfortunately he couldn’t guide Fulham to promotion and so for the good of his career he made the move away from Fulham to Premier League side Watford. Watford signed O’Riley for £20M in 2022. He started out as backup in the squad and was promptly sent out on loan to Udinese for the 22-23 season. Upon his return, he became a first-team regular as his club were relegated to the Championship. After guiding them to the PL and suffering immediate relegation, he left Watford for Crystal Palace. O’Riley joined Italian side Udinese on loan from Watford and helped them to win the Italian Cup. He made only 11 appearances and so won’t be too happy with his amount of playing time but he will be happy with his first playing honour. Crystal Palace signed O’Riley in 2027 for £13.25M and he went on to make 41 appearances in a Championship-winning season. This good season saw him impress Premier League side Burnley. Burnley brought in O’Riley from CP for £18.5M in 2028 to bolster their PL squad. He made 53 appearances in two seasons before joining his 5th permanent club and 6th overall. Burnley made a £11M loss on O’Riley as Bournemouth signed him for £7.5M. He played 20 matches for Bournemouth before rejoining former club Crystal Palace in January 2031. In O’Riley’s first season back with CP, he saw his side relegated from the Premier League. But Matt will be happy to have ended his career on a high, earning promotion back to the PL in his final season in football. Matt O’Riley never made an appearance for the English national side. He played 23 games for the Under 21’s but could never break into the first-team. Interestingly, O’Riley is eligible for both Denmark and Norway so it was surprising that with the lack of call-ups from England he didn’t opt to play for either of those nations. This entry was posted in FM Wonderkids | 20 Years On, FM18 Guides, Experiments & Wonderkids, Football Manager 2018 and tagged england, english championship, fm wonderkids, fm18, football manager, fulham, matt o'riley, ryan sessegnon. Bookmark the permalink.